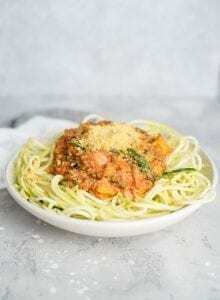 This hearty vegetable lentil pasta sauce is delicious served over a big bowl of zucchini noodles or it can be mixed with your choice of pasta. Try it with bows, penne or spaghetti. Cook the lentils. To make the lentils, bring the water to a boil in a pot then add the lentils, cover and reduce to a light simmer. Cook until the water is absorbed and the lentils are tender, approximately 15 minutes. These can be made in advance if needed. Make the zoodles or pasta. Either cook your choice of pasta according to package instructions or spiralize the zucchini, see notes. Make the sauce. Add the peppers, garlic, onion and tomato sauce to a pan and cook for 5-10 minutes. If you’re using red pepper flakes for spicy sauce, add those now. Stir in the spinach and cooked lentils (and nutritional yeast, if you’re using), cook for a couple more minutes then turn off the heat. Season with salt and pepper, if needed. Spoon over the zucchini noodles. Serve. Serve as is or top with more nutritional yeast or vegan parmesan, fresh cracked black pepper and fresh basil. I served this dish over raw zucchini noodles, I like the texture before when raw and they do soften up a bit when you serve the hot sauce over them. I would recommend peeling them before spiralizing if you want to do the same. The skins can be harder on digestion so I like to remove them first, plus the zoodles feel more spaghetti-like with the skin removed. If you prefer cooked zoodles, add them to a pan for 5-10 minutes until they soften up a bit. You can use the same pan you’ll use for the sauce, either cooking them before or after. Alternatively, you can stir them into the sauce right in the pan and serve it that way. This sauce is delicios served with regular pasta of any kind as well, or even on it’s own. It thickens up nicely the next day and is almost like a stew and is great topped with some extra vegan parmesan.